Pregnancy is an exciting experience for any woman, but there are ways it can impact your dental health that you should be aware of. Proper oral hygiene during pregnancy is critical for your health and the health of your baby. So you’ll know what to expect concerning oral health over the next 40 weeks, here are seven ways that pregnancy can affect your oral health. Your hormones change drastically when you’re pregnant, and this can leave you more susceptible to gingivitis. In fact, about 40 percent of women will experience gum disease during pregnancy. Symptoms include swollen, bleeding, and tender gums. Dry mouth is also quite common among pregnant women, which can be uncomfortable and lead to bad breath. To prevent this, keep yourself hydrated by drinking lots of water. You can also stimulate saliva production by sucking on sugar-free hard candies. Morning sickness is common during pregnancy, but the acid in vomit can weaken the enamel on your teeth and leave your teeth prone to cavities and decay. However, your enamel will be softened by the acid after you’re sick, so don’t brush immediately after throwing up. Instead, try to rinse your mouth with a baking soda and water solution to neutralize the acid, and then wait at least 40 minutes before brushing your teeth. About 10 percent of pregnant women experience a granuloma on the gums. The most common time to experience this inflammation is in the second trimester. Even though these can cause discomfort, they’re not a risk to your health. Your growing baby needs lots of calcium, and if there isn’t enough being supplied by your diet, then your body will pull calcium from places like your teeth. Calcium deficiency can cause brittle teeth, decay, weak roots, and other oral health problems, so eat lots of high-calcium foods. Periodontitis, a gum disease that’s commonly caused by bacteria, has been linked to both low birth weight and premature birth, so it’s crucial to take care of your oral health during pregnancy. Hormonal changes within your body can cause more than just gum diseases while you’re pregnant, and they can also cause some of your teeth to come loose because of how the hormones affect your tissue and bones. Being pregnant will take a toll on your body, and this includes your mouth, teeth, and gums. 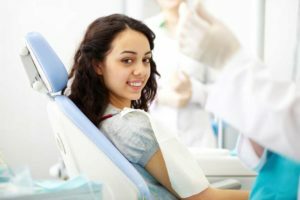 In fact, there are lots of ways that pregnancy can impact your dental health, and the best way to prevent problems is to schedule a cleaning with your dentist in Nashua, NH before you get pregnant. You should also schedule a follow-up checkup during the second trimester, eat a healthy and balanced diet, and continue with good oral hygiene habits for the duration of your pregnancy and beyond.